ISA launched the first hull of their new ISA 500 series one week ago. 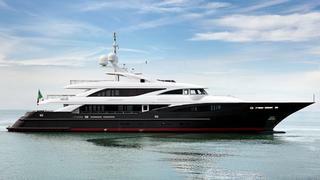 Named Liberty, this superyacht shares the same platform as two other projects currently under construction. Built in steel and aluminium, Liberty has a LOA of 49.95m and was designed by the in-house naval architects with an exterior styling by Andrea Vallicelli. This trideck motor yacht accommodates twelves guests in an interior designed by Stefania Biondo dalla Casapiccola from BDC Interior Design & Décor. The general plan shows a master suite on the main deck, a VIP stateroom on the bridge deck and four double guest cabins on the lower deck. Liberty is a displacement yacht, powered by twin 1,850kW MTU 12V 4000M71 engines giving a top speed of 16.8 knots, a cruising speed of cruising speed of 15.5 knots and a range of 2,200 nautical miles at 14 knots. Liberty will be delivered in May.